Also described as, "Troubleshooting Misaligned Mailing Labels"
If you experience a problem with misaligned labels or misaligned contribution statements when printing from Chrome, Firefox, or Internet Explorer, choose a different browser or try one of the following methods to fix the problem. To fix the problem, UN-CHECK the Fit to Page box. Then, print your labels. To fix the problem, select the Actual size option. Then, click . Go into the browser and press the ALT key to display the hidden menu. This will not work in the small mailing labels window, it must be done from the main browser window. 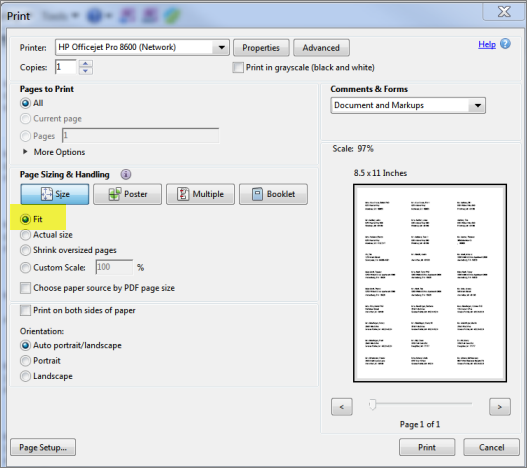 In the new dialog window select the Margins & Header/Footer tab. Set the top and bottom margins to 0.4. Then under the Headers & Footers section set everything to "--blank--". Click OK.
Now go back and print the labels. You do not have to regenerate them. With these settings saved they should print correctly. Currently, we do not have specific instructions for label alignment in Edge.